PF withdrawal – PF is retirement corpus and it is not advisable to touch PF, however under unavoidable circumstances you can do PF withdrawal. 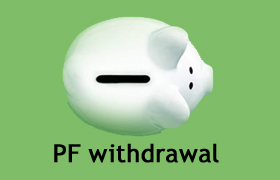 You might have heard that PF withdrawal is difficult and time-consuming procedure. In this post let us discuss about PF withdrawal process and applicable rules. You can withdraw PF in emergency situations during your job tenure. As per rule 7 different situations allows you to withdraw full or partial amount from PF. You can withdraw PF for medical treatment of your wife, children or parents. You need to submit proof hospitalization that treatment is going on since past one month. Approval certificate from employer need to be submitted along with withdrawal Form 31. You can withdraw amount up to your 6 month salary (Basic + DA). PF withdrawal is allowed for your marriage or marriage of your brother, sister and children. PF withdrawal can be done for your education or education of your children. In order to withdraw money for this reason you need to submit proof. You should be in job for minimum 7 years. You need to fill Form 31 for this withdrawal. For this reason you can withdraw 50% of Employee share with interest. You can withdraw money from PF for purchase or construction of house. You should be in job for minimum 5 years. Withdrawal of maximum 2 years salary Basic + DA is allowed. Under special case PF withdrawal is allowed for Home Renovation. To avail this facility your House should be purchased before 5 years. Maximum withdrawal of 1 year salary is allowed (Basic + DA). Form 31 along with self declaration need to be submitted for this withdrawal. PF withdrawal is allowed for Home loan repayment. In order to avail this facility you should be in job for minimum 10 years. Under special case PF withdrawal is allowed like closure of establishment for more than 15 days or if you are removed from job without any compensation or if you have not received salary for more than 2 months due to strike. Withdrawal of Entire employee share with interest is allowed. Certificate from employer along with form 31 is required. You will able to withdraw PF after 54 years of age and within one year of retirement. 90% of PF money can be withdrawn under this situation. Apart from above you can take PF advance in abnormal condition like damage to property due to natural calamity and also for investment in Varistha Pension Bima Yojana. Money from PF withdrawal is taxable if it is withdrawn before 5 years of opening of account. For more information you can refer to EPF withdrawal instructions. If you have left your Job and not planning to take other Job, than you can apply for final settlement via Form19. You can wait for two month before applying for this withdrawal. Before applying for settlement through Form19, you must have information about PF account number, Date of joining, Date of leaving, Bank account number and IFSC code. Take Form19 and Form10C from your HR department or download this form from EPF website. Fill these forms and submit both these forms to HR. 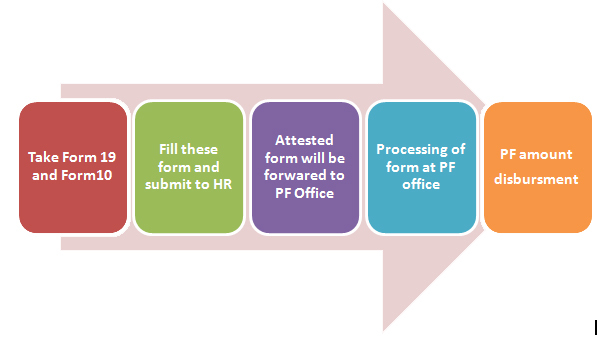 HR will attest these forms and forward it to regional PF office. The regional PF office will take one month to process your application. Once application is processed EFPO will deposit PF amount directly in your account. If it is taking longer time you can track application status online. Hope I have covered everything about PF withdrawal process and its rules. If you feel anything is missing in above post do let me know by submitting your comments.